It is comparatively easy to plan a brand-new urban quarter from the scratch. Less predefined structures or underlying conditions provide lots of scope for design. For instance, existing building complexes in the middle of a thriving metropolis set limits compared to empty building plots with nearly unlimited potential. 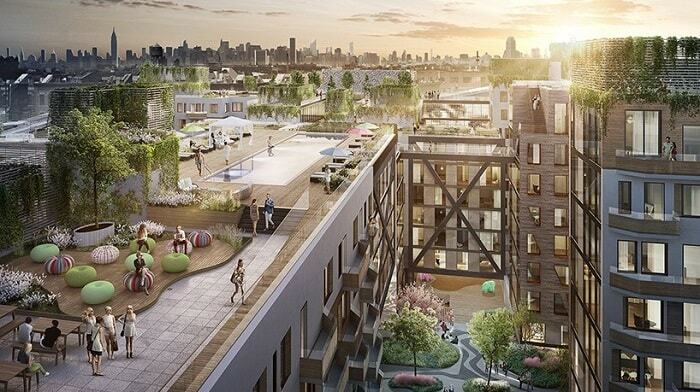 However, the following project Bushwick II seems to be a bit different. ODA, a New York-based architecture firm, was not afraid to break up existing structures in Brooklyn, one of New York City’s five boroughs. 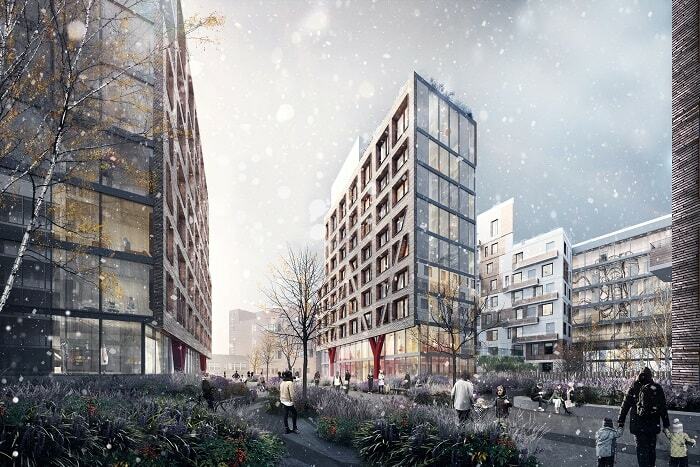 ODA New York recently presented its largest undertaking to date. 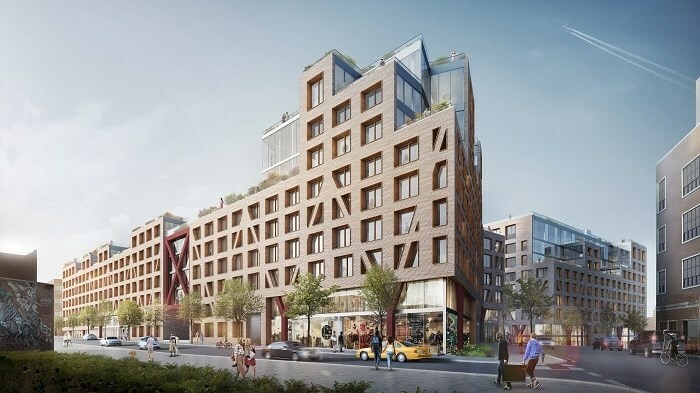 Providing 1,000,000 square feet of apartment units, Bushwick II is a city within the city and situated on the former site of Brooklyn’s Rheingold Brewery. It isn’t, however, a city in the sense that we’ve grown accustomed to or complacent about. 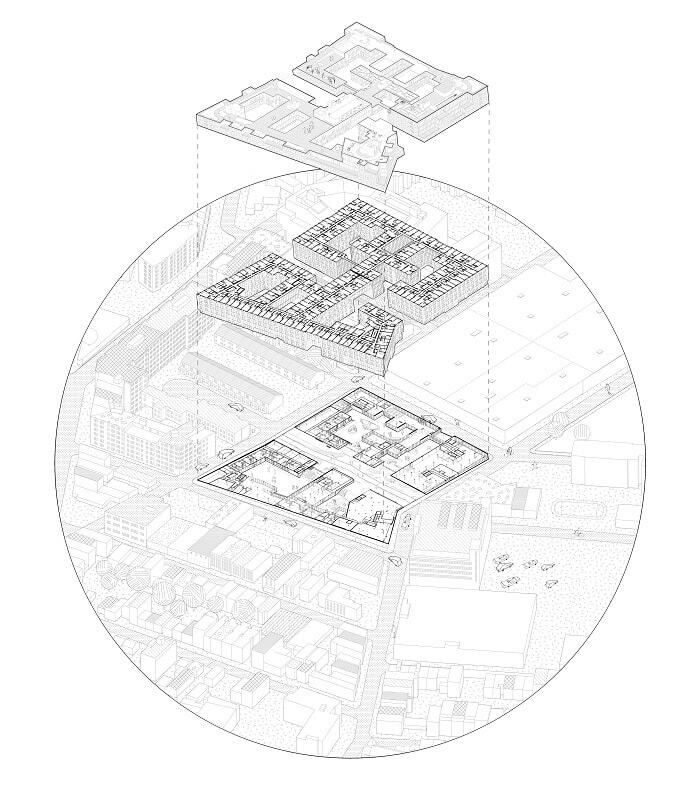 Inspired by European villages, Bushwick II enriches the NYC street grid with a meandering system of interconnected courtyards. Lushly landscaped and partially covered walkways and corridors in the courtyard areas give way to a parade of plazas, coffee shops, art galleries, lounges, fitness and recreational areas, study areas, and myriad other publicly-accessible amenities designed to continue to promote a sense of community in this increasingly vibrant area. Indoor connections between the complex’s internal courtyards and the external streetscape provide unusual openness and connectivity. Furthermore, single loaded corridors throughout the courtyard areas let in natural light. Project amenities continue on Rheingold Brewery site’s expansive, 60,000-square foot roof, where outdoor urban living is taken to new heights via a profusion of facilities aimed at relaxation, fitness, and general well-being, including an urban farm which will enable tenants to grow and harvest fresh produce on site. A 17,850 square foot park will run directly through the development’s center, creating a vast public promenade. 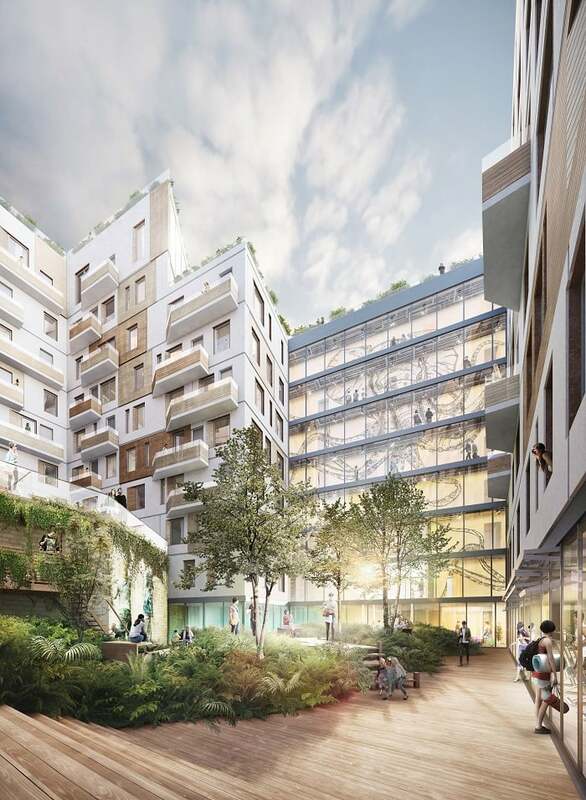 By opening the project in this way—in addition to providing 20% affordable housing, and making many of its offerings available to the public—ODA aims to create a highly porous community center which is functioning as a central circulatory hub and nexus for neighborhood activities. “Rheingold Brewery’s site presents an extraordinary opportunity to redefine some very fundamental aspects of what we’ve come to accept in urban living—an opportunity that I’ve been particularly privileged to undertake alongside All Year Management team headed by Yoel Goldman, who—in every one of our many collaborations—exhibits tremendous vision for the future of cities, premium execution methods and overall excellent professionalism. With Rheingold Brewery site, while technically a building by DOB standards, we conceived a series of nooks and voids. 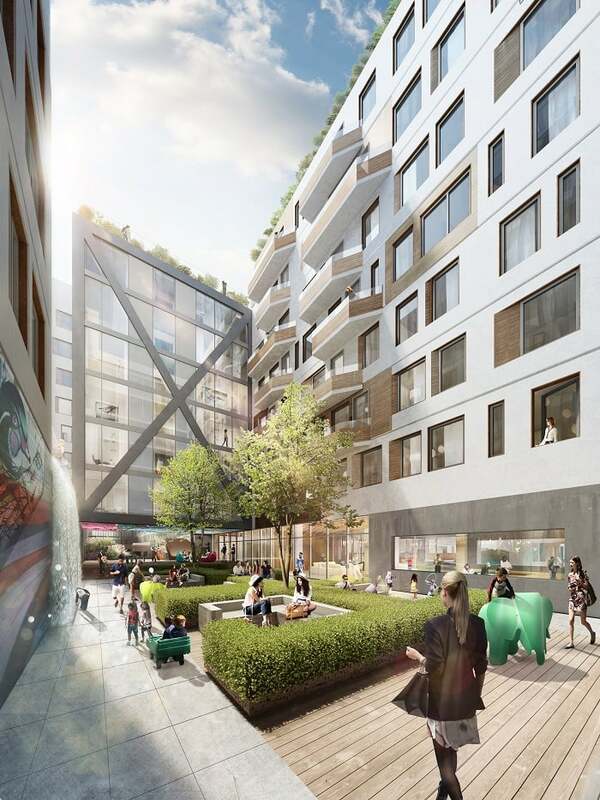 Social pockets which will be filled with plazas, parks, playgrounds, creative hubs and networking spaces, within which communities can grow and thrive. By interrupting the rigid order of a typical NYC street grid and blending it with the sequencing of a European village, the path becomes a meandering courtyard rather than a direct line from point A to B, a place where one can wander and find moments of discovery and interaction that are currently in such short supply in our daily lives.